Beautiful wooded community just minutes from South Park Mall. From this central location, residents can zip to South Park, Ballantyne, Uptown, or trendy South End. Living room features a wood burning FP & the open concept layout allows for easy entertaining. Versatile front sunroom can be used as an office, dining or sitting room. Spacious master bedroom. Large walk-in closets in all 3 bedrooms. Skylight in upper bedroom brightens the room nicely. Fridge, washer, dryer all stay. Corian kitchen countertop. 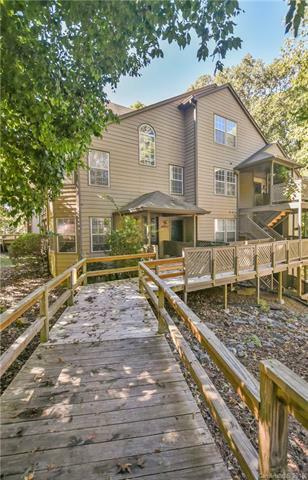 Amenities include pool & clubhouse with easy access to Greenway Trail along Sugar Creek! Water and sewer included in HOA dues. 2017 AC & 2017 hot water heater. This community is convenient to everything. The unit shows beautifully & is move-in ready with fresh neutral paint throughout.